On Sunday evening, December 12, 2010, the dead body of an unidentified clown was found in the quadrangle at the hub of the Bronwell Corners University campus, an apparent victim of a gunshot wound to the soul of his inner child. A thorough review of township records confirms the fact that no other person, not before nor since this darkest night of intellectual agony, ever died in Bronwell Corners, most especially not in the university quadrangle, and certainly not under the dreary veil of ludicrous impossibilities. Several uniformed members of the township’s special task force, known to area locals as the Bronwell Brigadiers, arrived at the scene just in time to tamper with what little evidence they could find. 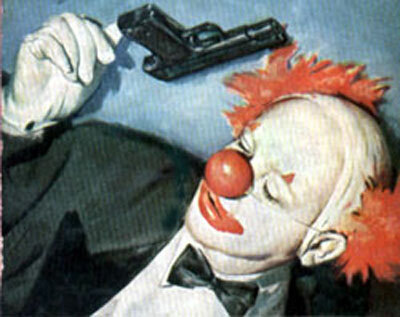 A black gun lay beside the dead clown’s head, but the brigade’s chief lab technician, Mr. Arnold Fetuccini, who had never before been pressed into duty, determined that it was a toy. “My investigation reveals the fact that the gun was a play thing, which does not rule out the possibility that it was indeed the murder weapon,” he said. “Of course,” he continued, “that’s assuming that this clown’s corpse was a recent and unfortunate victim of homicide and not the remains of a funny philosopher with suicidal aspirations. There’s got to be a study sitting somewhere deep inside a dusty library that reveals the high rate of self-annihilation for those who live their lives wearing costumes and masks.” Mr. Fetuccini said all of this without stopping to think, and then he bent down close to the dead clown’s decomposing body and studied it for signs of foul intentions. There was no blood on, nor in the vicinity of, the corpse. But the dead clown’s spirit most definitely looked damaged, ragged and frayed at the edges, wet and sticky to the touch, hard and cynical at its center. As the undeniable evidence of mortality slowly sank into the dull minds and weary hearts of horrified investigators, the clown’s smile loosened, sagged, stiffened in its new position, and then surrendered itself to reveal the vague outline of a life misspent. But before Deputy Galileo could wipe the sleep from his eyes and expel the shock from his system, the gun disappeared. Harriet Hampton, sole reporter for The Bronwell Bulletin, arrived at the scene of the crime just in time to hear Deputy Galileo make his grandiloquent speech and draw his vain conclusions. The story she penned that evening about this episode was based on rumor. In paragraph two Mrs. Hampton wrote that the purpose of all conversation among human beings is to quell one rumor by raising yet another. She went on to explain that our trade in fearful gossip is what we name our soul. Uninformed, delicious chatter, claimed Harriet Hampton, was perhaps what killed the clown. The Bronwell Corners City Charter requires that all township citizens sign an oath, a promise never to threaten a friend with a lie and never to destroy an enemy with honesty. The populace, for the most part, remains pleased with, and faithful to, this arrangement. They therefore have no problem with existential mysteries and disappearing guns. Yet, this one dead clown lying in the middle of an otherwise peaceful quadrangle gave many people pause to consider the fact that no one knew the man, and no one ever would. When the town’s mortician, Harriet Hampton’s husband Creighton, scrubbed away the dead clown’s makeup, he discovered that beneath the grease and gloss the man owned no face. So he stated in his report that the clown was indeed an impostor and not an actual person. This apparent fact, insisted Creighton Hampton, did not lessen the severity of the crime, although it did help to explain the nature of a bloodless death. “A poet,” said Mayor Ewing next morning. He stood before the town’s one television camera and spoke into the microphone that the station’s manager had borrowed from the grammar school auditorium. Key members of the Bronwell Corners Brigadiers surrounded him at the lectern. “A poet?” asked Harriet Hampton. She quick picked up her reporter’s pen and pad and recorded the mayor’s reply. “So you consider the mystery solved?” asked Mrs. Hampton. Hanging high on the pine-paneled walls of The Bronwell Corners’ Township Council Chambers is a portrait of Warren G. Harding. Council members that very afternoon met and agreed that a return to normalcy was in order. And with a show of hands they all agreed.